This River must be crossed. With an MFA in film as well as a law degree, writer/director Courtney Hunt told Filmmaker Magazine’s Scott Macaulay that she “wanted to do a story where women were really active, where they were really doing stuff. Not relationship stuff,” (Summer 2008; pg. 35). After her first short film was picked up for PBS’ American Playhouse, Hunt found herself fascinated upon the discovery of real life female smugglers going between New York and Canada and bringing in human traffic to provide for their families by crossing the perilous St. Lawrence River. After setting her thoughts to paper, she interested former Homicide: Life on the Street and 21 Grams actress Melissa Leo as well as talented young Skins actress Misty Upham to appear in the 2004 version of the short film before finally, in true independent spirit, she and her husband raised enough money to turn Frozen River into a feature length work. Lauded by filmmakers such as Quentin Tarantino and winner of Sundance Film Festival’s Grand Jury Prize along with numerous others, Hunt’s subtle film offers one of the year’s finest, underrated acting portrayals by veteran star Melissa Leo. 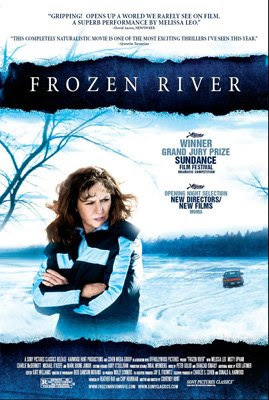 Now playing in limited theatrical release, Frozen River has skyrocketed to the top five list of the best films I’ve seen so far in 2008 and may very well be the most impressive work I’ve seen all summer. Truly under the radar, so much that a press screening wasn’t even held for Hunt’s film and it’s receiving little in the way of advertising, Frozen River, which was shot “in sub-zero weather in Plattsburgh, New York” on an HD Panasonic Varicam as noted in the press release, relied heavily on a young, energetic, and eager New York cast and crew to bring this multiple award winning labor of love to the screen. Buoyed by a tour de force portrayal by Leo, whom Hunt encouraged “to watch John Wayne in Rio Grande,” to study the way “he does absolutely nothing but gives up everything,” (Filmmaker, 92), the film is truly a testament of the undying devotion that mothers have to provide for their children. Leo stars as Ray Eddy, a hardworking, tireless mother whose gambling-addicted husband has fled their home with money for the down payment for a new doublewide trailer home just one week before Christmas. And it’s heartbreaking to watch as the proud mother tries to appeal to the trailer deliveryman’s good nature in ensuring she’ll be able to provide a suitable home for her children as you can see in the clip below, which certainly rings true in our struggling economy as so many people find their homes jeopardized. While her fifteen-year-old son T.J. (Charlie McDermott) offers to get a job to help contribute, Ray adamantly refuses, telling him flatly that not only has he got to go to school but he’s also got to be there to look after his younger brother. Eager to track down her husband, she tries all of his usual haunts in the Land of the Mohawk and when she notices his car in the parking lot of the local Territorial High Stakes Bingo Parlor, tries to find him herself, encountering a dead end in the form of a woman who refuses to let her into the parlor without paying an entrance fee. The first of many scenes that illustrate the double-standards and reverse racism and sexism in the community on both sides, the angry yet determined Ray follows a mysterious young woman she sees driving her husband’s car. Following a confrontation with the woman named Lila (the talented Misty Upham), upon realizing that her husband is nowhere to be found, she finds herself striking a tentative bargain with the young Native American woman who promises that she’ll be able to help her sell her husband’s Dodge Spirit. It’s only when she gets to the other side of the reservation across the river that she realizes Lila’s true intention is to use Ray in the highly dangerous, incredibly risky yet overwhelmingly lucrative venture of human smuggling. Running Chinese and other immigrants who pay forty to fifty thousand dollars to gain entry from Canada into America via cars with push button trunks before they’re delivered to amoral “snakeheads” at a local motel that make the immigrants work for years to pay off their entry fee, soon the desperate Ray is in way over her head. Still trying her best to legitimately provide for her family at Yankee One Dollar discount store where her rude manager denies her the chance at a full time position in favor for a young, skanky, and perpetually late girl with a visible lower back tattoo, Ray inevitably finds herself going back to work alongside Lila. And soon both women realize that they have far more in common than one would’ve assumed due to their initial prejudices and assumptions. Although it’s erroneously labeled a traditional thriller and advertised as such, this tense and gripping character drama distributed by Sony Pictures Classics has earned its talented filmmaker countless accolades which is all the more admirable when one realizes it’s just her first feature length work. Deceptively leading the viewer into thinking it will end one of several ways, the film admittedly does venture into thriller territory as it continues but it never feels forced. Every moment seems entirely justified and logical given the character-driven approach and the roadblocks they face along the way. Although Hunt admitted in Filmmaker that “it’s a hard movie to watch” since “most people don’t live in that world, and asking someone to sit there for 97 minutes and live in a trailer is tough,” (pg. 92) Frozen River is far worth the investment. As opposed to the endless, ugly indie dramas such as The Savages and Margot at the Wedding that we were bombarded with last year is that instead of pretentious, self-involved, overgrown children who don’t resemble anything remotely real, we’re painfully drawn in by Hunt’s authentic approach and the realization that mothers will stop at nothing to protect their children. In fact, Margot and The Savages are far more depressing than River is (for entirely different reasons) and Hunt is talented and intelligent enough to weave us through the many twists and turns of Ray and Lila’s journey in a way that we find ourselves incredibly compelled, sympathetic, fearful yet actively engaged through the whole running time. And as Leo told Jason Guerrasio in her Filmmaker cover story Q&A, “Pride is not an easy emotion to come up in me, but yeah, I’m very, very proud of Frozen River and what I brought to it,” (pg. 38). I think even the previously cited clips are proof enough that the pride is well-deserved and I urge you to seek the film out. And while I expect we will definitely be seeing actress Misty Upham in far more work down the road, in the end it’s Leo who commands our attention in a way she hasn’t since 21 Grams. Moreover, much like human trafficking, it’ll be an absolute crime if she (as well as Upham’s supporting performance) are overlooked come Oscar season. So, taking a cue from Hunt who just wanted to make a film where women “were really active” and “doing stuff” as opposed to meeting cute with photogenic and dreamy rom-com leading men, your active to-do list for today is to brave the weather, pack a jacket, and venture onwards to Frozen River.